A classic trick that is perfect for performing after dinner using a number of coin sleights to fool the magician’s dinning companions. The magician either borrows four coins or uses four of his own. He places four coins in one hand and then slaps them down on the table - one of them has vanished and he retrieves it from under the table. He then takes three coins and repeats the move, showing that, again, one of the coins has magically passed through the table. Again and again the magician repeats the move until all four coins are shown to have passed through the solid table. A napkin in the lap and a number of sleight of hand moves are the key to performing the Coins Through a Table trick. Any four coins will do, as long as they are the same denomination and can be easily handled and vanished by the magician. A cloth napkin in the lap is helpful, which is why this trick is great for after dinner. The magician should spread the napkin on his lap in such a way as to catch falling coins silently without allowing them to roll out of his lap. If four identical coins can be borrowed the magician is granted a little extra amazement, but this trick works fine with coins the magician produces. The magician, through the course of the dinner leading up to performing, should make sure he is seated close to the edge of the table with the napkin spread in his lap. The left hand is closed to a fist and held near the edge of the table as the right hand points to the left. “Four coins are here…” the magician says, and then raises the right hand up and open, “… and no coins here.” At that moment the bottom most coin should be dropped from the left hand to land quietly on the napkin in the magician’s lap. The right hand is placed in the magician’s lap (and picks up the coin) as the left hand is brought forward. “Pay attention” says the magician, and then slams the hand down, palm down, on the table. The coin in the right hand should be rapped against the underside of the table a moment after. The fourth coin is tossed on the table and the other three are picked up with the left hand. “One, two, three” says the magician, tossing the coins into the right hand, making sure than one falls into position for a finger palm. The coin should be palmed as the hand is turned over and the other coins are tossed into the left hand, which quickly makes a fist. The right hand (hiding a coin) picks up the fourth coin from the table and moves under the table. The magician again slams his left hand on the table, then removes to show only two coins and two coins are produced from under the table. All four coins are placed near the edge of the table, two in front of the left hand and two in front of the right. With right hand pick up one coin, counting and place it on top of the second and then pick up both coins. 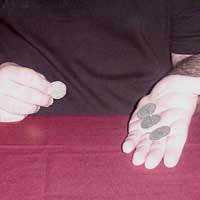 With left hand magician picks up a coin, “one” and places it on top of the second, “two”, but as he pulls them up into his hand the second coin falls into the lap. The right hand goes under the table again and retrieves this third coin. Again the left hand slams onto the table and only one coin is revealed, the other three coming out from underneath in the right hand. Toss all coins on the table. Magician picks up one coin and does finger palm vanish into left hand, “one”, and then picks up the other three coins, “one, two, three.” A final slam shows that the fourth and final coin has travelled through the table and all four coins are produced from under the table. Because of the multiple sleights required, this trick should be given a lot of practice before performing.